New in 2012, these 120g dairy snacks come in Wild Chocolate and Cool Bananas flavours and are free of preservatives and artificial colours. They are easy to transport and store with no need for refrigeration. Each comes in an easy to use ‘squeeze’ pack. Developed specifically for school canteens by specialist manufacturer ProPortion Foods, That! Dairy Snacks meet the ‘green’ healthy foods criteria. That! 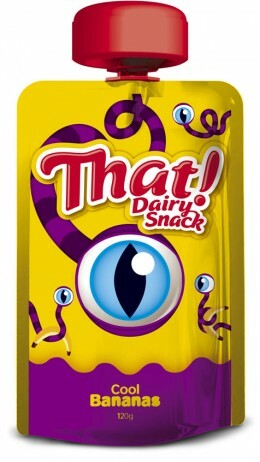 Dairy Snacks will be available from 2012, with the product launch supported by advertisements in K-Zone, Total Girl, on Cartoon Network and social media, and with a special competition and giveaways. The manufacturer says the product has received a positive response from more than 500 primary and secondary students during its sampling campaign. To request a sample or find out more, contact ProPortion Foods on 1300 302 162 or email info@proportionfoods.com.au.